Dr. Merheb is a pain management doctor with almost 20 years of experience providing high quality care. He is Board Certified by the American Board of Pain Medicine, the American Board of Interventional Pain Physicians and the American Board of Anesthesiology. South Florida Patients – and from all over the world – can benefit from his international expertise in pain management, anesthesiology, and spinal care. Dr. Merheb completed a three-year residency in clinical anesthesiology intensive care and pain management at Wayne State University, Detroit Medical Center at Detroit, Michigan. This training was in addition to completing a one-year residency in internal medicine, also at Wayne State University, and residencies in anesthesiology, internal medicine, and emergency medicine after earning his medical degree from the Université de Aix-Marseille II in Marseille, France in May of 2000 where he graduated with honors. Prior to joining Spine & Orthopedic Center, Dr. Merheb served as Director of the Pain Clinic North Arkansas County Medical Center in Mountain Home, Arkansas. Dr. Merheb is fluent in three languages: English, French and Arabic. In his leisure time he enjoys tennis, snow skiing, and boating. 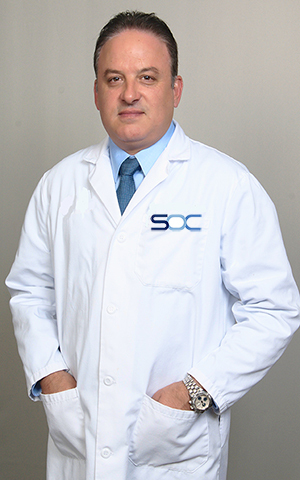 Dr. Hicham Merheb patients can visit him at Spine & Orthopedic Center in our 4 different locations. For more information, please call 24/7 at 1-888-409-8006 or fill out our appointment request form.